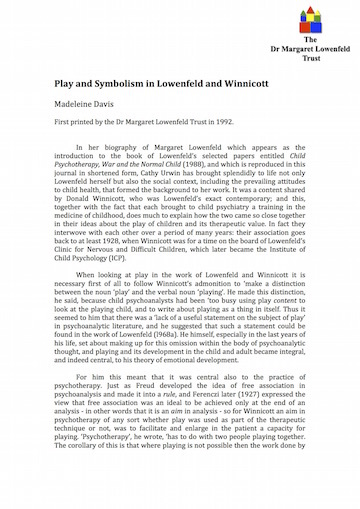 Margaret Lowenfeld developed the World Technique, often referred to as ‘sand play’, in the late 1920’s because of her frustration with the limitations of traditional talking therapy in the psychoanalytic tradition. She wanted to find a way to engage with the inner life of children and to understand the ideas, feelings and emotions that they were often unable to communicate in words. Lowenfeld began to provide opportunities for children to express their thoughts and feelings and to reflect back what she felt children were experiencing using toys and sand trays and she found that the children responded immediately. She continued to develop this approach to working with children at the Institute for Child Psychology. 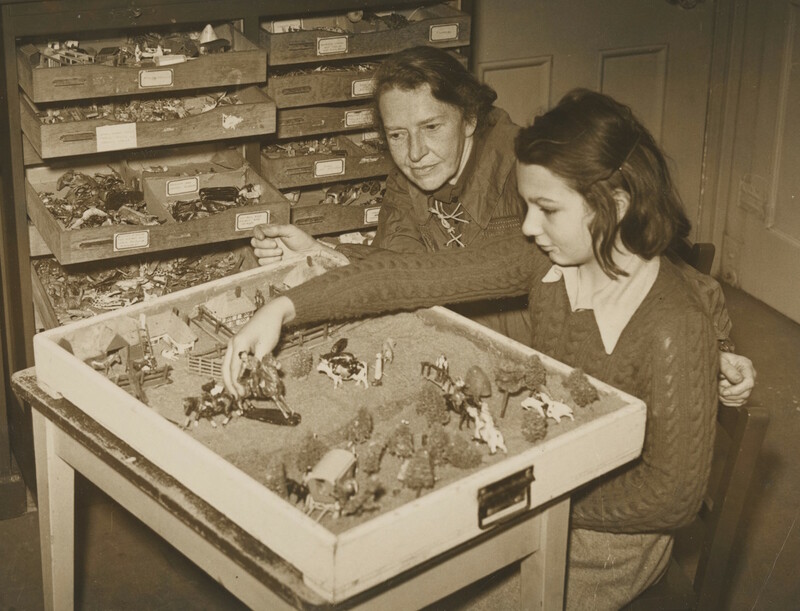 She provided some trays with wet sand and other trays with dry sand and a cabinet of toys sorted into different categories – for example, animals, action figures, buildings, vehicles etc. There were also tools including shovels, funnels and sieves etc. that the children could use to experiment with the different textures of wet and dry sand. This approach is often referred to as sand play but Lowenfeld called it the World Technique because ‘World’ was the word that a child had used to describe what they had made with the sand and toys. Source: images@wellcome.ac.uk ‘Margaret Lowenfeld working with a child at the Institute of Child Psychology using the World Technique.’ The World Technique has previously been exhibited in the Wellcome Collection in London. The Worlds of the children would be carefully recorded by therapists at the Institute including a drawing of the World, the process of exploring the sand and making the World and child’s description of what they had made. The therapist might ask, ‘Tell me about what you have made?’ and would try not to make any sort of interpretation of the work. Lowenfeld did not buy into any one theory to explain the child’s creations. She gradually developed her own theories about what was happening in the child’s mind, for example Protosystem Thinking and Theory of E (See Selected Papers in Books and Publications). She commented that Freudian therapists might make sexual interpretations and Jungian therapists might invoke archetypes in the sand but she preferred to listen to the child’s own idea of what it meant. For example, she said that to one child a horse might represent a feared animal whereas to another it might be a beloved friend. In fact, the animal used might not represent that species at all, but might be in place of another creature or thing. Recording Worlds became an important part of the records collected by the Institute and also an important part of Lowenfeld’s own research and the development of her thinking about children. These ideas evolved over the years into her theory of the Non-Verbal Thinking of Children (see books and publications). For more information about the World Technique see: The World Technique by Margaret Lowenfeld and other publications. We’ve recently created new videos demonstrating the World Technique, please let us know what you think. These can be viewed on the Lowenfeld website or on youtube by following this link.